Concept: For Daiya’s latest campaign they’ve created a heart and stomach-warming video that they are encouraging their fans to share for a chance to win one of 150 Boxes of Love. 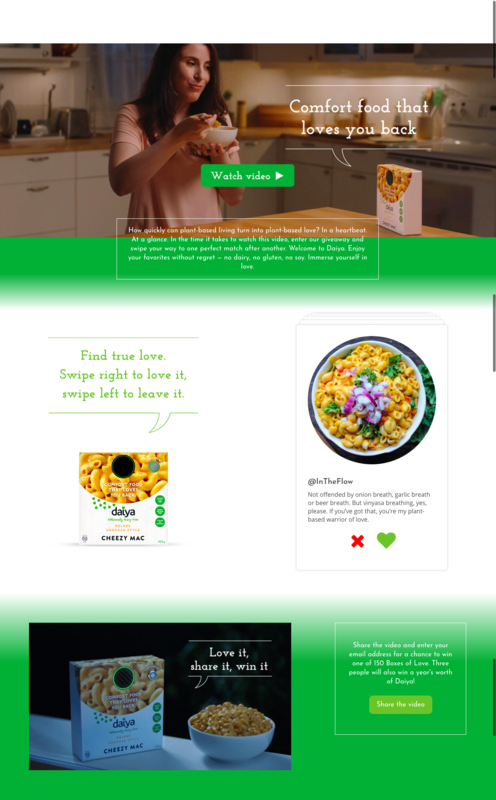 Objectives: Increase awareness of Daiya’s comfort food product line, acquire new emails, and increase engagement on their “Loves You Back” video. People love their comfort food, but oftentimes those foods aren't very kind in return. Whether it's for allergies, health, environment or something different entirely, it's time people finally had comfort food that loves them back. Daiya is doing just that, by giving their fans products that let them enjoy their favorites without regret – no dairy, no gluten, no soy. To help their fans find true love, Daiya is currently running a unique and fun play on your traditional sweepstakes. Daiya is asking their fans to share their new “Loves You Back” video for the chance to win one of 150 Boxes of Love – a box of Cheezy Mac that “loves you back” via a speaker button that plays same loving sentiments so often directed towards these comfort foods – and three very lucky people will also have the chance to win a year's worth of Daiya! What makes Daiya’s sweepstakes unique is that their entry form only appears after you click a share widget to share the video. A deliciously smart way to encourage your fans to share and view your content. To check out their full campaign, as well as swipe right to find your true comfort food love match, here. Daiya’s Sweepstakes’ DCI score will be a combination of an Engagement Score (ES) and Virality Score (VS). Daiya’s campaign is built around fun engaging and shareable content, primed to get their loyal fans excited. Embed on your website. Brands that embed a campaign on a larger website often see increased engagement through additional clicks and time spent on site. Offer a relevant prize. Many loyalty programs offer their customers the same types of rewards: discounts, free shipping. While appealing, catering your rewards menu to your fans will increase enthusiasm and participation by tapping into your consumers’ interests. Video is only getting hotter. Video is still having a major moment, and brands and marketers are in a great position to leverage enthusiasm for video to activate consumer sharing and reach new and existing audiences across social channels. Learn more about the value of adding video to your next campaign here. Keep your fans coming back. Campaigns traditionally see a surge of activity immediately after launching, but that initial enthusiasm gradually dissipates without ongoing promotion. By spreading out rewards or exclusive content brands can encourage repeat visits, sharing and generate ongoing momentum for their campaign. The rise in video, and new tech capabilities around sweepstakes and entry paths is giving brands and marketers the opportunity to engage consumers in new ways which offer high pay off in terms of virality and engagement.